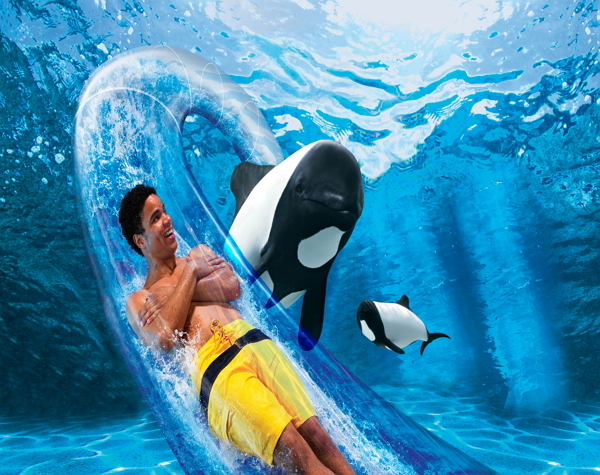 With a wide variety of activities, SeaWorld is a great idea for the first full day of your vacation – stadium-style shows means there are tons to see without having to line up in the searing heat! Make sure you pick up a show schedule and take 10 minutes to plan your day proceeding clockwise (or counter-clockwise for you lefties) around the park – running from one side to the other will get old fast! Journey into the world of majestic killer whales in One Ocean – or learn more about Orcas, and other species of whales during a special educational show called Ocean Discovery. And of course, there’s nothing quite like sitting in the splash zone! 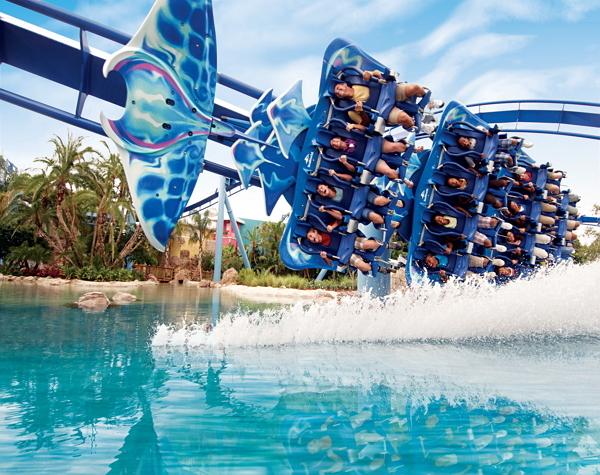 SeaWorld has delivered the thrills with Mako, the fastest, tallest, longest coaster in the Orlando market. The ride is designed as a “hypercoaster,” which experts define as having a height of 200 feet, high speed, no inversions and a bundle of air time — the lift out of seats that enthusiasts covet. For the record, it’s getting rave reviews! Read our full park reveiw and find out more HERE. 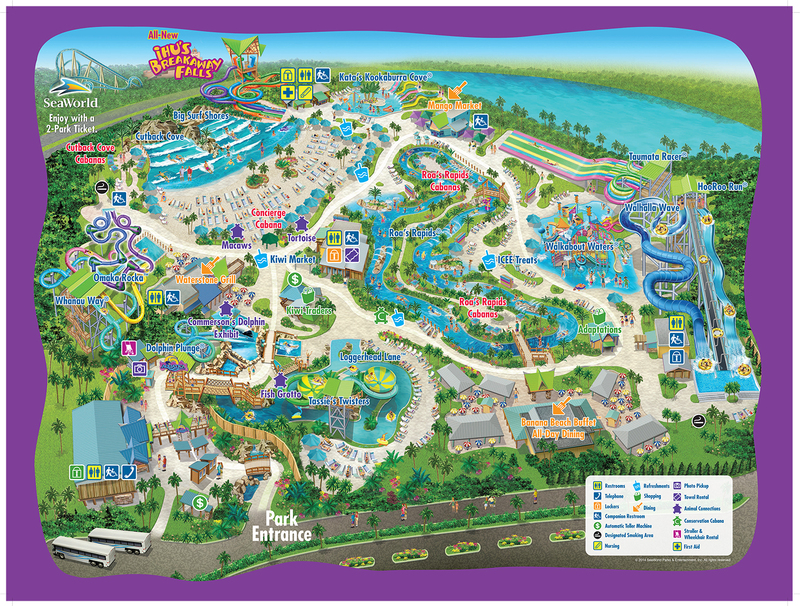 Aquatica Orlando is a whimsical, one-of-a-kind water park only the clever folks at SeaWorld could create – a fab combo of up-close animal encounters, flowing waters from serene to extreme, high-speed thrills and wide, sandy beaches. 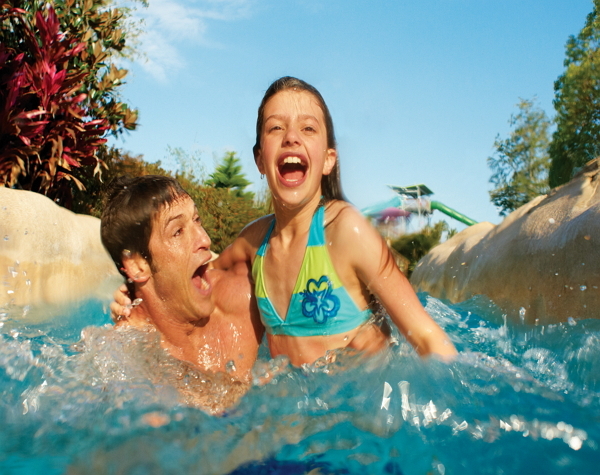 Aquatica guests essentially get to play in, over, and under the water! There are nearly 60 acres of lush landscape inspired by the vivid colors and carefree lifestyle of the South Sea Islands. It’s little bits of New Zealand, Australia, and New Guinea, all rolled into one – good on ya mate! Cutback Cove & Big Surf Shores are giant, side-by-side wave pools offering gentle swells or ripper surf! Potentially the most popular ride in the park is the quite unique Dolphin Plunge. Two side-by-side enclosed tube sides send you racing through an underwater world that is home to a playful pod of beautiful black-and-white Commerson’s Dolphins. 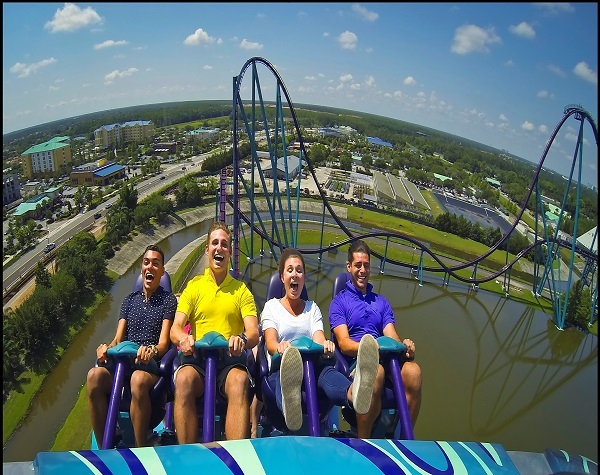 Busch Gardens Tampa is a combination of animal encounters and a superb collection of white-knuckle thrill rides and caters to a whole variety of tastes and age groups.The park officially features 8 roller coasters and 2 water rides amongst other rides and animal attractions. 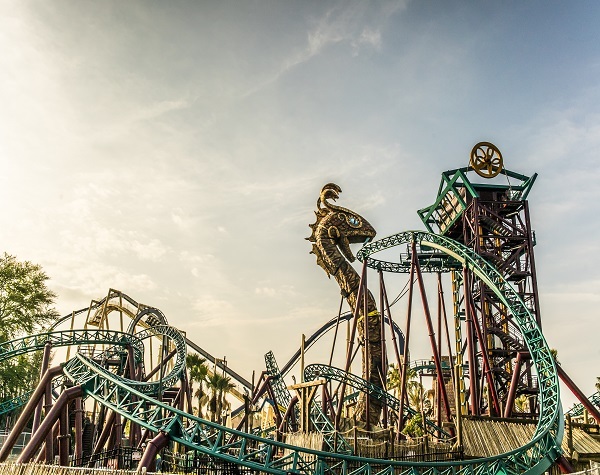 Its newest roller coaster, Cobra’s Curse, was opened in June 2016. Free bus transportation is available to Busch Gardens on the Busch Gardens Shuttle Express. This service departs from various locations in the International Drive and Kissimmee areas (subject to change). Reservations are a must and can be made by calling 1-800-221-1339. With your All Day Dining you can enjoy your favorite foods from your favorite restaurants! (some restrictions may apply). At SeaWorld Orlando eat at: Voyager Smokehouse (excludes Baby Back Ribs), Seaport Pizza, Spice Mill, Seafire Grill, Mango Joe's, Captain Pete's and Expedition Café. At Busch Gardens Tampa you may visit the following restaurants: Zagora Cafe, Crown Colony® Cafe, Bengal Bistro, Zambia Smokehouse (excludes baby back ribs), and Desert Grill (excludes baby back ribs). At Aquatica Orlando: Banana Beach Cookout, Mango Market and Waterstone Grill. And at Adventure Island Tampa you may eat at Mango Joes and Surfside Café. Second visit and All-Day Dining must be redeemed within 14 days of first visit. These tickets are Turnstile Ready E-Tickets. A: We will send you real tickets in the post. The SeaWorld ticket is a gate ready ticket printed on A4 paper. There is no need to exchange this ticket. Scan the barcode for entry. We use only recorded delivery and will notify you once your tickets have been sent. Please read our SHIPPING POLICY for more details. Q: Can I use this ticket to visit SeaWorld, Busch Gardens or Aquatica in the same day? A: No. This ticket is restricted to one park per day. 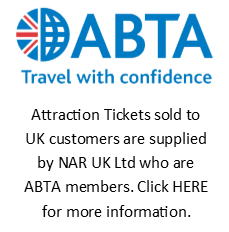 Q: If I have to cancel my holiday, can I return these tickets for a refund? A: Subject to our terms and conditions and if the tickets are unused we may be able to refund these tickets. Q: Does the ticket expire? A: Yes. The second visit must be used within 14 days of the first visit. A: No. Parking is not included. 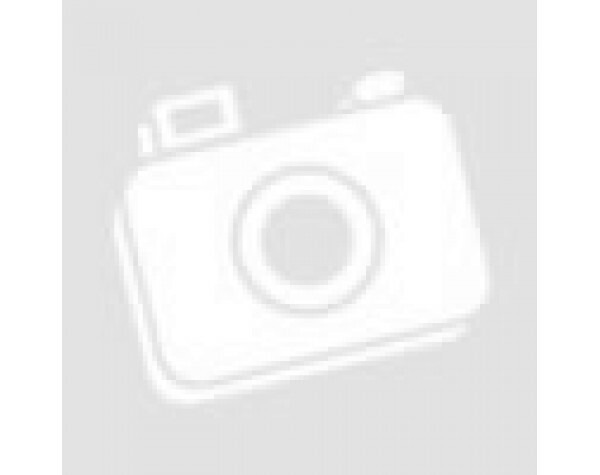 Q: What Disabled Access is there? A: Wheelchair access is available at both SeaWorld and Busch Gardens, however, some thrill rides may have limitations on accessability. Q: What are the opening times? 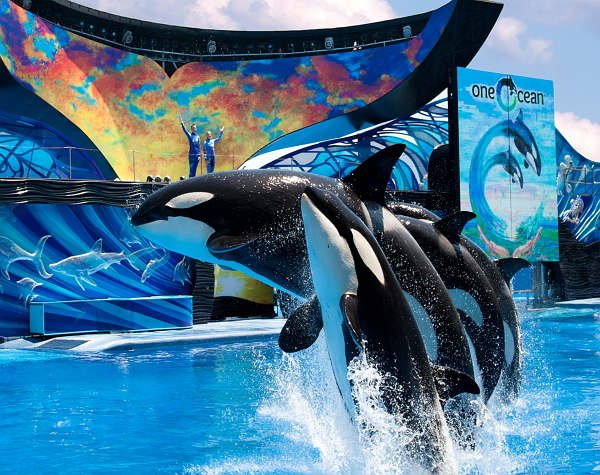 A: SeaWorld is open daily from 9am until 9pm although this can vary seasonally. 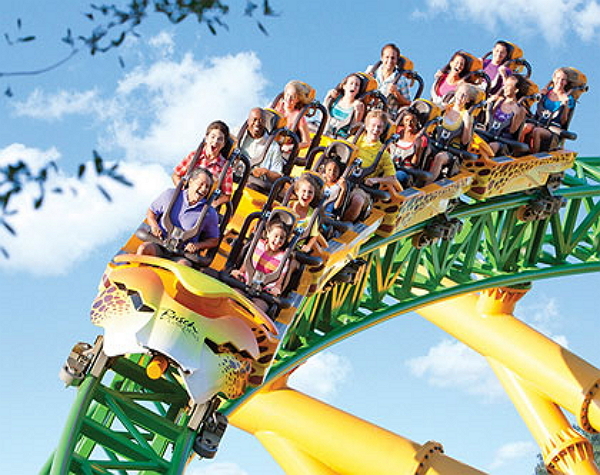 Depending on the time of year, Busch Gardens is open from 9.30am - 10am to 5pm - 9pm. 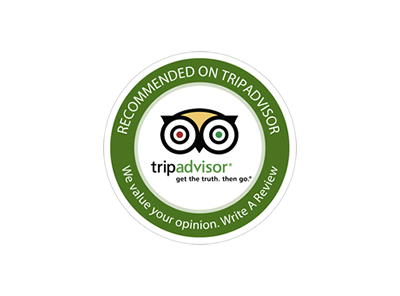 We recommend you check directly with the attraction for specific opening times. Aquatica opening times vary so please check directly with the attraction. 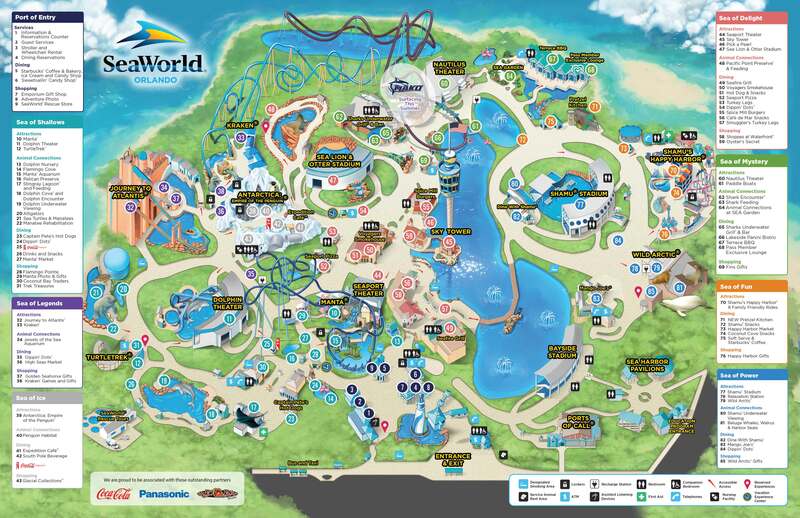 Here you can find the latest park maps so you can start planning your visit right away. You can also find these by downloading the OrlandoAttractions.com APP where you will have access to park hours, ride wait times and much more! 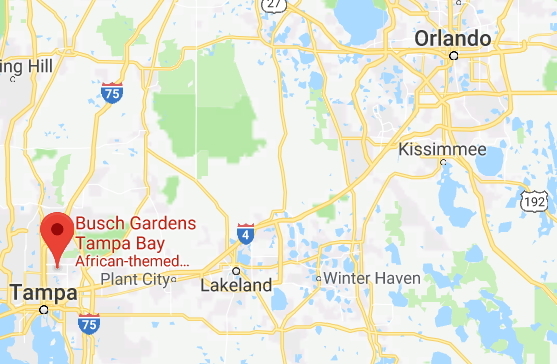 Busch Gardens Tampa Bay is located at the corner of Busch Boulevard and 40th Street. Address: 10165 N McKinley Drive,Tampa, FL 33612.